It looked like it was going to be a great summer for the blackberries that we have in our back yard. We had a wet and cool spring and beginning of summer. The bushes were loaded with berries waiting to ripen. Then it hit the heat and the dry weather. The last week or so we have not seen a drop of rain and the weather has been so hot. Which is not good for the berries and they have been drying up on the bushes. I had a list of blackberry recipes that I was hoping to try, but I can see now that it’s not going to happen. 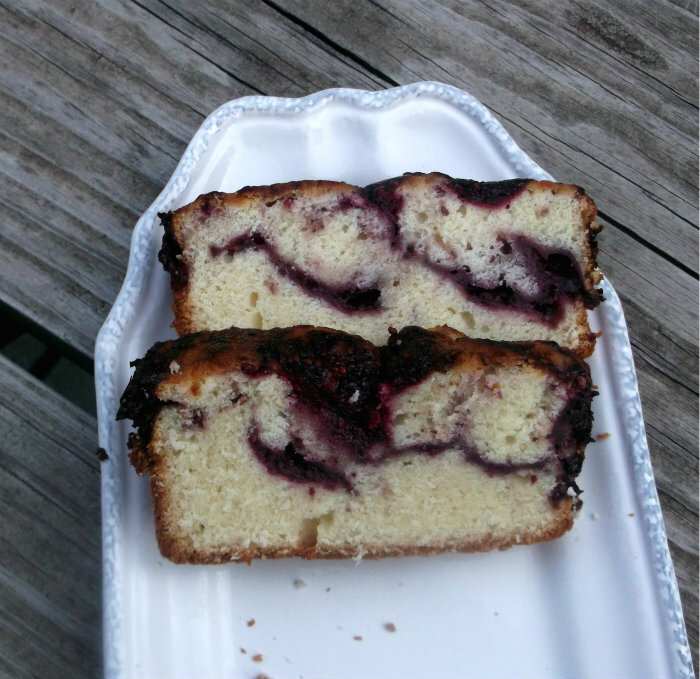 The blackberry swirl pound cake was one of the recipes that was on the top of my list so I am happy that we were able to pick enough berries for this one. I found this recipe on the Martha Stewart website. It caught my eye because of the blackberries of course, but also because we love a good pound cake too. The cake is dense and sweet, and as it ages it gets a little bit moister. The berries go well with the buttery flavor of the cakes. Top it off with a dollop of sweet whip cream or a scoop of vanilla ice cream and you will have a dessert that everyone will be raving about. 1. Preheat oven to 350 degree F. Lightly butter a 5 x 9 inch loaf pan and flour. In a food processor puree blackberries with 2 tablespoons sugar. In a medium bow, whisk together flour, salt, and baking powder. 2. In a large bowl, using an electric mixer beat together butter and 1 1/4 cup sugar until light and fluffy, about 5 minutes. Add eggs and vanilla and beat to combine, scraping down sides of the bowl as needed. With mixer on low, add flour mixture in 3 additions, alternating with the sour cream, beginning and ending with the flour mixture..
3. 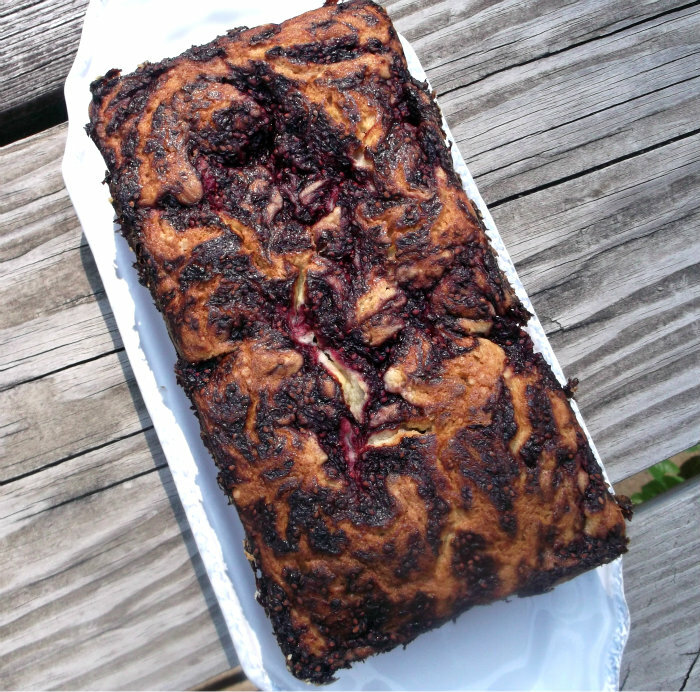 Transfer half the batter to pan and dot with 1/2 cup blackberry puree. Repeat with remaining batter and puree. With a skewer or thin blade knife, swirl batter and puree together. Bake until golden brown and a toothpick inserted in center of cake comes out clean, about 1 1/4 hours. Let cool in pan on a wire rack for minutes. Remove cake from pan and place on a serving plate, let cool completely before slicing. We have so many blackberries here in Oregon right now. This pound cake looks pretty & delicious. I have to admit I haven’t done much baking with blackberries. It’s funny that the recipe you chose is probably exactly what I’d choose if I had a limited supply. I’m so sorry to hear that you didn’t get much berries, but I’m glad you were able to harvest enough for this lovely loaf! It looks just too good! Sometimes the weather doesn’t cooperate, nut at least you got to make this delicious pound cake. Looks amazing, makes me want to go buy some blackberries right now. I wish I had blackberries in my backyard! But I’m sorry your crop didn’t come in this year. But there’s always next year, right? Anyway, this looks wonderful – thanks.